Here with the two boys and their schismatic teddy bears, Mahomet and Ali, is the companion card, My golliwogg’s called Jesus. The double ‘g’ at the end of the word is the original spelling in the illustrated stories of Florence Kate Upton published just before the end of the nineteenth century. Bears existed as dolls at that time but were named Teddy after Theodore Roosevelt in 1902 when he seems to have spared a bear on a shooting trip (during which presumably he killed lots of other things). 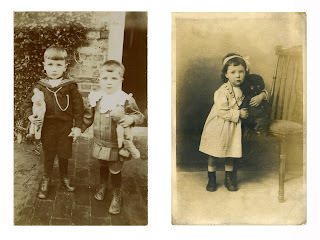 Both gollies and teddies were at the height of their popularity when these photographs were taken by their anonymous postcard photographers around the time of the First World War. I had one of each as a child in the Second World War, among other worn, handed down dolls, three of which are described in Curriculum Vitae I. Except for CND marches in the fifties and, during the struggle against apartheid in South Africa (when I joined a group which showed internationally under the heading Artists Against Apartheid), I have not been much of a political activist. 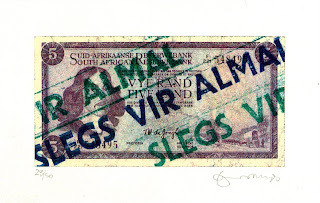 Slegs Vir Almal (Reserved for everybody), Silkscreen, edition 50, 1976. I mistrust all ideology and even managed, though strongly influenced in matters musical by Cornelius Cardew and John Tilbury, to dodge the Red Dawn Rising Over Luton. In fact the only card-carrying political affiliation I have had is with Clapham Young Conservatives having early discovered that their ping pong facilities were much superior to those of the Young Socialists. Ping pong diplomacy did not end there. 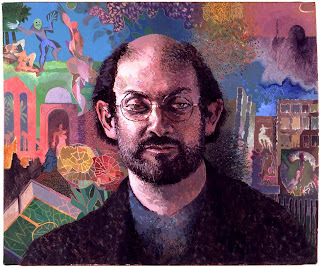 Salman Rushdie, at the height of the fatwa, adopted a deliberately irregular routine, with much cloak and daggery in the coming and going, of portrait sittings combined with ping pong and pizza. The story of the teacher and the teddy bear brought back memories of that passive activism; of painting Salman, sometimes with an armed guard in the studio and always with heavy back up outside. When illustrating my translation of Inferno I also made a picture of both Mahomet and Ali, to whom Dante gives such short and brutal shrift in Canto XXVIII. That was in the early eighties and then one hardly needed to give it a second thought. Current Islamic orthodoxy bans depictions of the prophet. This applies to Moslems of course, but cannot to those who hold other religious beliefs (or no belief at all). Why shouldn't other faiths, sects and cults claim equal rights to make their rules apply to all? Overwhelmed with a Swiftian deluge of observances we might soon be struggling to remember if the Ammonites decreed that we should wear a funny hat on a Tuesday or if the Theodolites commanded that we should not eat turnips in June. 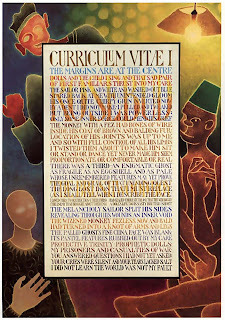 I return to my painting, if only to note ironically that it shows the clear influence of Islamic calligraphy. 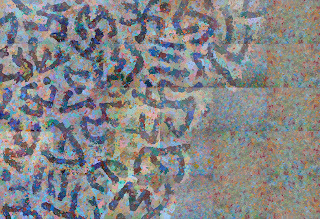 It was precisely these strictures against description of the natural world that made the finest Islamic artists probe the expressive possibilities of script and bring an often sublime inventiveness to enrich to the art of the world. Golly! Golliwogs and ping pong and Islam and Young Conservatives and Jesus and Mahomet all in one blog. awesome.